This week, several members of our team are joining hundreds of thought leaders, speech-language pathologists, and aphasia advocates in Boston for the first inaugural AphasiaAccess Leadership Summit. 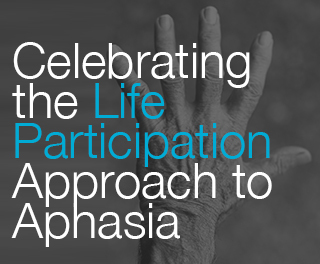 Together, we will celebrate the committed clinicians and partners who champion the life participation approach to aphasia (LPAA) treatment while also sharing the latest research for individuals with aphasia. The LPAA encourages clinicians and researchers to focus on the real-life goals of individuals with aphasia. For example, in the initial stage following a stroke or brain injury, a common goal may be to establish effective communication with the surrounding medical staff. At a later stage, a life goal may be to communicate with loved ones or participate in the local community. The LPAA embodies the principle of hope: hope for improvement; hope for reconnection with loved ones; hope for independent communication, and that’s a principle we’re pleased to support with a line of research-backed products. In fact, for more than 30 years we’ve partnered with the brightest minds in the aphasia community to bring products and solutions that offer hope for improvement. By teaming up with AphasiaAccess, we’re pleased to further advance the field and raise awareness of the communication disorder that impacts more than one million people. Our team will be sharing the latest aphasia research in multiple areas during Friday and Saturday’s poster sessions. If you would like more information about our presentations, please contact us at info@lingraphica.com.